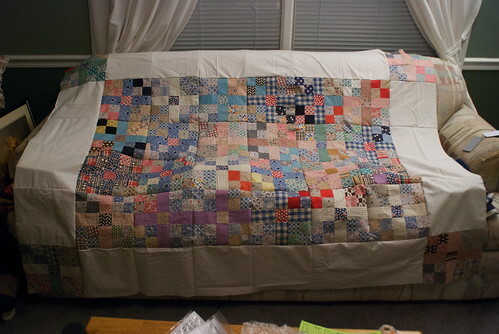 I think back, and I know exactly where it started: a double wedding ring quilt that was sewn by my father's mother. I didn't know her well; let's just say there were severe family differences, but I was too young to be cognizant of that fact at the time. I just knew that I liked the quilt, and it kept me warm. 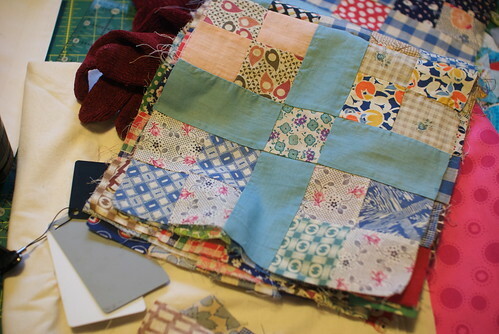 When I look back through the eyes of adulthood, the eyes of someone who has now made a few quilts of her own, I know it was probably pieced out of clothing scraps, and the centers were either plain white cotton or unbleached muslin. The batting was cotton. It's why I still like the low, dense loft of cotton now. I remember how this quilt felt against my body as a child, and that I seek that same sensation in quilts now. Polyester has the same warmth, but it's weirdly fluffy to me. The quilt is long gone. It had tears even then, and even if I'd known how to do it when I was a teenager, probably very little of the quilt could have been salvaged. It was a utilitarian object, intended to get more life out of fabrics too worn to wear, and when it was truly done, it would be scrapped. I thought about this quilt when Hallie first showed me her quilt fabrics. They'd been sewn by someone in her family -- a great-aunt? her great-grandmother? Someone. They were never finished, but pressed carefully and put away in a drawer. Hallie wanted to know if anything could be done with them. We counted them up and laid them out on the bed. Twenty-nine squares, each one roughly 9" square when finished. They weren't perfect. I actually had a lot of fun looking at the back of the squares and seeing ragged seam allowances, uneven hand stitching, random bits of machine stitching, and out-of-square blocks. They weren't perfect but they were the product of some actual, unknown set of hands. The prints were all old, but I had (and have) no idea how old. My main thought when working on the squares? It would take so little effort to make sure these squares see the light of day. I couldn't figure out how to make it work as a full-sized bed quilt without adding in a lot of filler fabric. At the time I told her I thought it a better idea to turn these into a baby quilt or a twin-sized quilt; when she announced some time thereafter that she was pregnant, the path was immediately obvious. A baby quilt, then, for her unborn daughter. Since we were sent home from work early today due to ice and snow, it seemed the perfect opportunity to settle in and get some work done on this quilt. It took some finagling to make some of the squares work, since some of them were skewed, but I've learned that quilts are amazingly forgiving of sewing imperfections if you're careful about working around them. It came together quickly, over the course of a snow-dusted afternoon, and when I stretched out the quilt top on the couch for its beauty shot, I was far more contented with it than I expected. It's about 10" wider than I'd normally make a twin-sized quilt, but I don't want to touch, muck around with, or alter these blocks. I've got enough splashy, bright fabric for the backing, and -- as I said before! 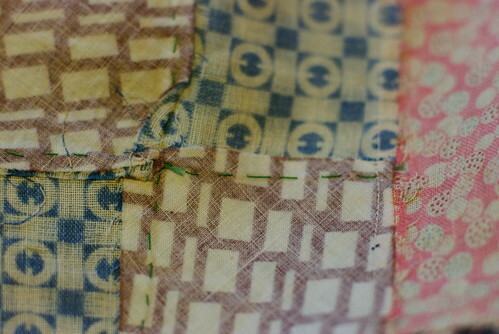 -- quilts are amazingly forgiving objects. It'll fit just fine on a twin-sized bed. I'm tickled to know that these fabrics will finally see use after all these years, and it makes me hope that someday, if I leave unfinished quilt blocks, there will be another set of hands to finish my work.